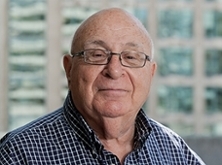 Dr. David Farber, Distinguished Career Professor of Computer Science and Public Policy at the School of Computer Science and a member of the ISR core faculty, was recently tapped by Stevens Institute of Technology to become one of their first inductees to Stevens’ newly unveiled Hall of Achievement. Stevens Institute of Technology, located in Hoboken, New Jersey, is one of the nation's preeminent institutions of higher technical learning. Established in 1870 by the family of inventor Edwin Augustus Stevens, the university is home to three national Centers of Excellence and is alma mater to numerous notable alumni; including Charles Stewart Mott (co-founder of General Motors), Beatice Hicks (founding president of the Society of Women Engineers), and Eugene McDermott (founder of Texas Instruments). Established to acknowledge Stevens alumni who have made extraordinary impacts which shaped their respective fields, the first class of inductees to the Stevens Hall of Achievement include Lawrence Babbio Jr, Elizabeth Bailey, Charles Stewart Mott, Frederick Reines, and David Farber. Farber, a Stevens alumnus (‘39, M.S. ‘61, Hon.D.Eng. ’99), is considered by many to be the “Grandfather of the Internet”. His distinguished career spans more than 50 years and he has made foundational contributions to electronics, programming languages, and distributed computing, to name but a few. His work has earned him countless awards and honors, including induction as an IEEE Fellow, ACM Fellow, the 1995 SIGCOMM Award for lifelong contributions to computer communications, and a spot in the Pioneers Circle of the Internet Hall of Fame. Dr. Farber will be inducted into the Stevens Hall of Achievement during the Celebration of Stevens’ event on Saturday, May 7, 2016 at 6:30 p.m. More information can be found at Stevens’ website.